UK builder Meercat Boats is hoping to sweep aside last year’s woes, as it celebrates the confirmation of several new construction orders, plus the successful launch of its latest workboat – billed by Meercat as its “most robust to date”. In 2017, Meercat was rocked by financial problems and entered administration, before being acquired by a private owner in November and parting ways with former partner Burgess Marine. In March this year, the firm launched its new M18 multi-purpose workboat: a steel, 18.75m x 8.7m monohull designed for both port-based services (including dredging support) and offshore construction/maintenance support work. 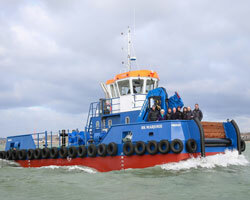 The first unit has been delivered to multi-purpose workboat fleet owner BK Marine, which has christened her BK Marjorie. According to Meercat managing director, Jason Coltman: "The M18 is the the largest in our M range, but we can build bespoke vessels up to 24m, or tailor existing workboats to suit the exact requirements of clients in our purpose-built workshops." The M18 features a moulded depth of 2.5m, a bollard pull capacity of 12tonnes and the capability to carry up to 85tonnes of cargo, including liquids. When fully loaded, the boat will draw 2.1m. The workboat is also equipped with an HS Marine AK67E4 crane, which grants the vessel a lifting capacity of 3.095tonnes at an outreach of 13.62m. Power is provided by two Doosan V158TIH engines, each rated 353kW at 1,800rpm, driving 1,200mm-diameter, nozzled propellers and resulting in a service speed of 9.5knots. The vessel complies with UK Maritime & Coastguard Agency (MCA) Workboat Code Category 2 requirements, thereby permitting operations to a range of 60nm from the nearest safe haven. The M18 also offers a degree of design flexibility: for instance, the model “can offer a variety of deck and internal arrangement options”, Meercat adds. The builder has also secured orders for: a 22m landing craft, for a Scottish fish farm; an 18m utility vessel, intended for delivery to the Shetland Islands; and – as the next to be launched, this coming May – a £500,000 (US$711,245) oil spill response vessel, for a European client.